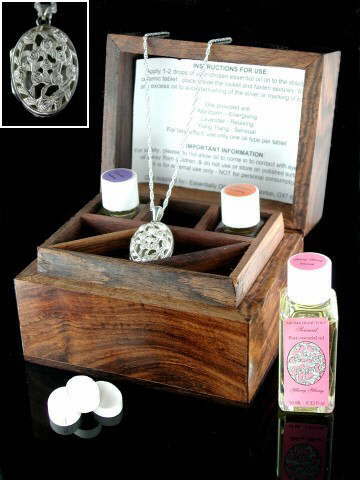 Fabulous CrystalAroma Wooden Box set. This lovely boxed set would make a super present. It contains a sterling silver, filigree, rose design locket which is tailor-made to take either a specially designed tablet, on to which you place a few drops of aromatherapy oil, or a gemstone cabochon. It comes complete with three tablets, three aromatherapy oils: relaxing Lavendar, sensous Ylang Ylang and energising Mandarin and three gemstone cabochons. The gemstones all relate to the oils and are: Amethyst, Rose Quartz and Carnelian. The wooden box is of excellent quality and comes complete with instructions and a cardboard outer. The close up inset picture shows the sterling silver locket which comes with an 18" Prince of Wales sterling silver chain.